Marco On The Bass: Happy 50th Buster Bloodvessel of Bad Manners! 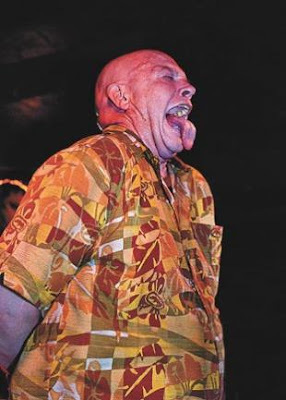 Buster Bloodvessel (Doug Trendle) celebrated his 50th birthday on September 6th. The ska legend, famous for his bald head, big belly and one of the largest tongues in the music business plans a 50-city UK tour to celebrate his birthday. He's quoted in the Manchester Evening News as saying, ""Most people only have the one party when they turn 50, but me? I've decided to go for 20 parties in September with 30 more on either side." Buster and Bad Manners had 9 Top 40 UK hits in the early 80's including "Lip Up Fatty", "My Girl Lollipop", "The Can Can", "Special Brew" and "That'll Do Nicely" and gave Madness a run for their money as the Kings of Ska comedy. 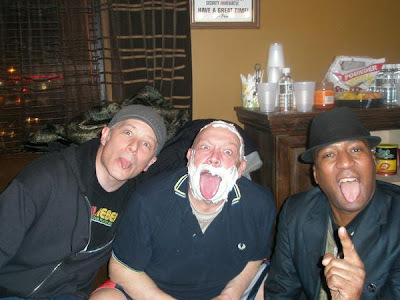 My band had the pleasure of performing with Buster and Bad Manners this past March and he proved once again what a down-to-earth gentleman he is. I was also able to witness his pre-gig routine of head shaving that he has done since the early days of the band and compared tongue size with him. It was no contest. Thanks to Steve From Moon at the Duff Guide To Ska for the heads-up on Buster's 50th. need a chat box tho,to get peeps incontact....i think its a bother for people to leave comments n thanks..etc......so for the last few posts you have done THANKYOU .